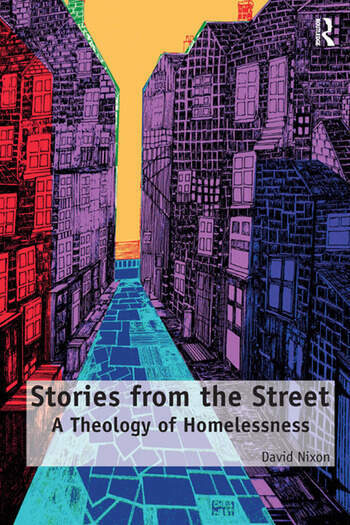 Stories from the Street is a theological exploration of interviews with men and women who had experienced homelessness at some stage in their lives. Framed within a theology of story and a theology of liberation, Nixon suggests that story is not only a vehicle for creating human transformation but it is one of God's chosen means of effecting change. Short biographies of twelve characters are examined under themes including: crises in health and relationships, self-harm and suicide, anger and pain, God and the Bible. Expanding the existing literature of contextual theology, this book provides an alternative focus to a church-shaped mission by advocating with, and for, a very marginal group; suggesting that their experiences have much to teach the church. Churches are perceived as being active in terms of pastoral work, but reluctant to ask more profound questions about why homelessness exists at all. A theology of homelessness suggests not just a God of the homeless, but a homeless God, who shares stories and provides hope. Engaging with contemporary political and cultural debates about poverty, housing and public spending, Nixon presents a unique theological exploration of homeless people, suffering, hope and the human condition. Revd Dr David Nixon is an Anglican Parish Priest in Plymouth. His interest in social exclusion/inclusion began during a curacy in the same city, working with charities and local organisations concerned with housing, homelessness and community development. As a part-time research fellow at Exeter University, he also worked with the No Outsiders research team investigating education and sexualities in primary schools, and has published widely in academic journals in this area.